When it comes to smartphone cases, the vast range of iPhone cases outstrips the choice available for any other smartphone. After all, for smartphone cover makers, iPhone cases are smart business ­ thanks to Apple's production cycles, it's likely that the majority of iPhone users own one of just three shapes of iPhone, compared to dozens of differently shaped Android phones from several manufacturers. Nor do iPhone users have to stick to regular old protective suits of armor that merely buttress their phones' fragile glass surfaces. Designers have created lavish silicone lobster cases that reference Salvador Dali; artists have designed cases made to look like cement, complete with footprint. Then there are the companies which believe it both marketable and clever to sell cases that look like guns, knives and Bibles. As for owners of non-­iPhones after an unusual cover, they mostly need to settle for this scruffy teddy bear case. We scoured the web to find its strangest – and most strangely compelling – iPhone cases. Let us know which gets your vote for the absolutely most bizarre. The iPhone 5 represented yet another feat of technological engineering from Apple – faster, more powerful and even thinner than its slender predecessors. But you can do something about that. Designed for a Barbie­-themed Spring '15 collection, this oversized pink silicon case will give your iPhone 5 or 5S the girth of an ancient desk­-bound phone, and the retro street cred of an army of Rollerbladers. There's a silicon faux antenna, a window for the camera lens and the requisite number of old­-world telephone buttons to faux-­press. Oddly, the faux mouthpiece and earpiece will be on the wrong side of the phone when you’re actually using it. Color options are strictly bright pink and it does not fit into any pockets. The Yellow Jacket cover cunningly conceals a 950,000V stun gun capable of deploying 1.3mA of baddie-zapping electricity. That's enough to convince any would-be perp to take his criminal intent elsewhere. 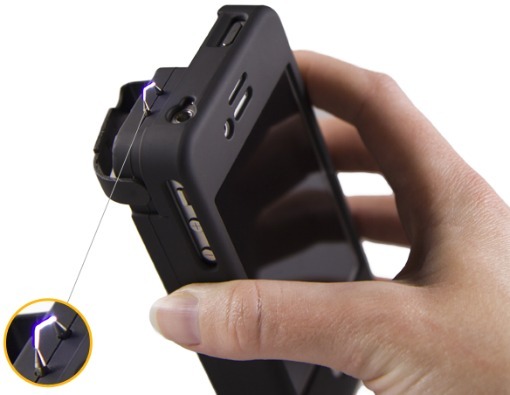 The stun gun is detachable, with dual triggers that need to be pressed simultaneously. Safety switches on both sides should keep you from accidentally shocking yourself through your pocket. The soft plastic TPE case protects the phone from bumps and drops. And, if you choose the version with additional 1800mAh battery pack, you can charge your phone as well as the stun gun. It has a five-LED indicator for the overall juice level. 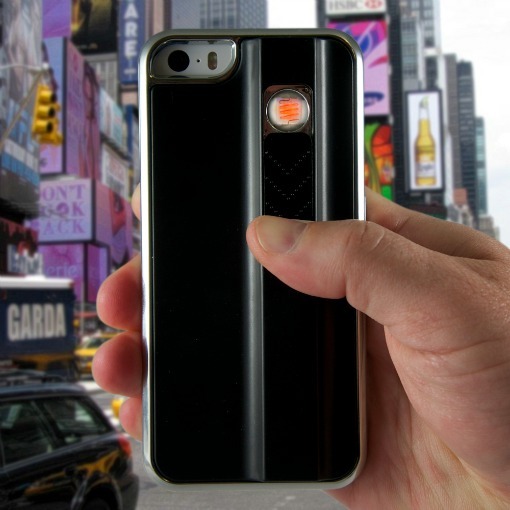 You can get your taser-slash-phone-cover in red, white or black. In Japan, plastic replicas of food for display outside restaurants is a booming industry that has evolved into a true art form. 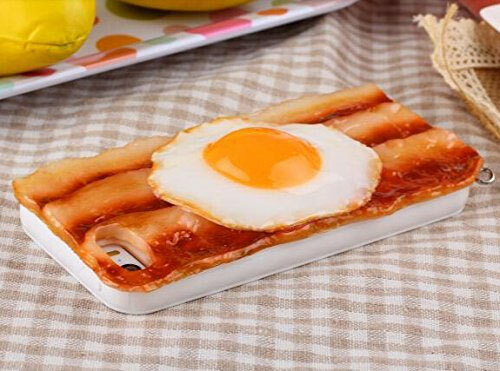 This bacon-­and-­egg-­backed iPhone case is an homage to the trade. Complete with the glistening of frying oil, the plastic sunny­-side-­up egg is set on three slices of bacon atop a hard plastic case with holes for the necessary ports, plus the camera. Just slide on and go. If bacon and eggs aren't your bag, you can select a shrimp fried rice or grilled fish case. Other smokers might pilfer your plastic lighters, but if you've got your phone – and it's in this case – you've got fire. While having a heat source near your iPhone doesn't seem like the safest design, the lighter itself is a circle of electric wire whose heat is only activated by pulling on a plastic slider on the back of the case. It's wind-proof and, according to the “glowing” user reviews, capable of lighting a cigarette in minimal time. A bumper around the plastic case also shields your phone from impact. Comes with a microUSB cable for recharging the lighter. Sometimes you just need to stick your phone to a window, right? Right?!? 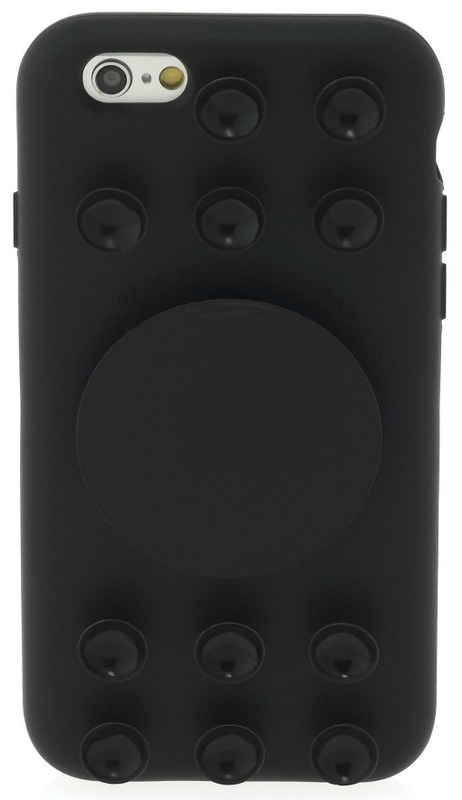 This Marc Jacobs case for the newest iPhone is festooned with suction cups that can attach that iPhone 6 to smooth surfaces such as fridges, windows or car dashboards, allowing it to double as a poorly-­positioned in­-car sat­nav mount or a means of consulting smartphone recipes in the kitchen. The silicon case wraps snugly and thickly around the phone, ensuring that even if those suction cups fail to do their job, your phone is protected when it slams into your tiled kitchen floor. It comes in yellow, peach, orange or black. 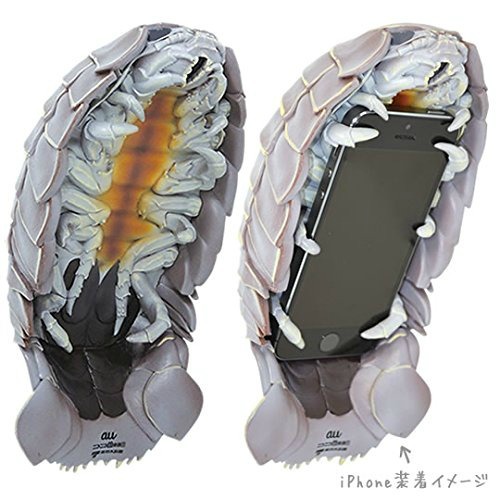 500 units of this case designed like a gigantic deep sea cockroach were released last summer in silver and gold models. The replica isopod is based on a real­life isopod in Toba Aquarium, weighing two pounds when it arrived and named “Giant Isopod No.1”. No.1 became famous when it stopped eating for five years, before dying a noble death in 2014 – at which point it was commemorated in this metallic iPhone sheath. 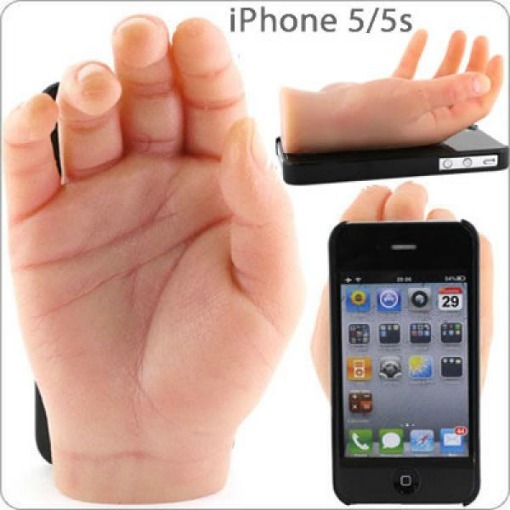 Unfortunately, even eBay is currently out of stock of this hugely limited, terrifying iPhone case, where it last sold for $150, although you can get pale doppelgangers. Backing a standard black plastic case is this highly realistic replica of a lady's hand, rendered with palm lines and wrinkles generally garnered through being alive. Each hand is made individually, and, according to its manufacturer, the texture is “soft, fleshy”. Unfortunately, without a hole for the camera lens, the case needs to be removed every time you want to take a picture. But while holding hands with this faux-­hand when taking a call may feel creepy (or gently reassuring, depending), it comes into its own when you place your phone face down – the hand can now hold small items like a pen or your reading glasses. If the iPhone 6's uber­-minimal slim lines leave you cold, maybe you'd prefer to encase that soulless piece of silicon in a shaggy technicolor fur coat that looks like the love child of Cousin It and Ziggy Stardust. 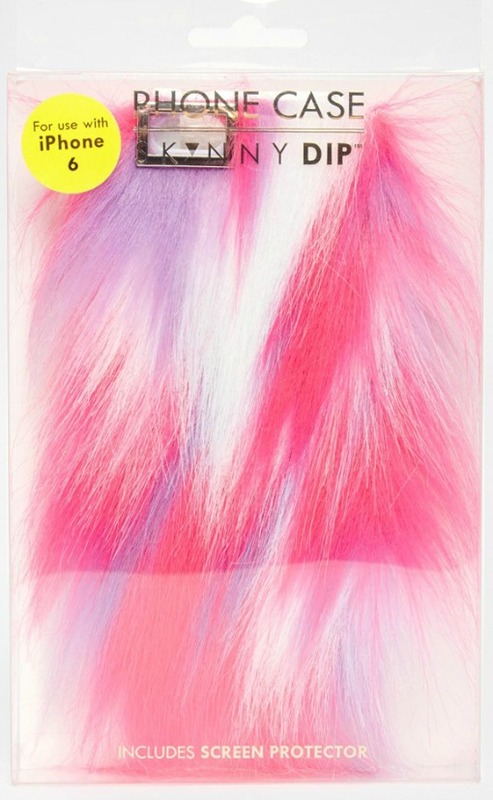 Its polyester hair is fuzzy to the touch, its underlying plastic case protective of your iPhone 6's delicate edges and a bundled screen protector keeps that 4.7­inch screen free of scratches – though it won't be able to protect you from the jealous glances of your disco-­loving peers. It’s so weird, it’s actually pretty cool…. It’s cool but totally impractical since you can’t fit the whole thing in your pocket. Well, you MIGHT be able to fit it in your pocket. You just need to be prepared for a lot of “Is that an isopod in your pocket or are you just happy to see me?” jokes.